Status: Inactive; Active 1990-1992. Born: 1952-08-23. Spaceflights: 1 . Total time in space: 7.91 days. Birth Place: Buedesheim. BIRTHDATE AND PLACE: August 23, 1951, Buedesheim / Germany . EDUCATION AND EXPERIENCE: 1959-1974 school in Oldenburg, Cochem, Memmingen, Bonn and Schelkingen, 1974-1976 training as an aircraft mechanic while attending at the officers school of the German Air Force, 1976-1980 studied Air/Space Technology at the Armed Forces University in Munich, Degree in Engineering and a Diploma in Chemistry, 1980-1988 Pilot for single and multi jets, high performance aircraft, 1988-1989 trained as a Test Pilot in Maching and at ETPS (Boscombe Down), achieved Test Pilot Class 1. 1988-1990 tested aviation equipment. FLIGHT EXPERIENCE: Jets: F-104G, Tornado, Alpha-Jet, F-16. Transports: Transall:, Do 228, Do 28. Beside flying these aircraft, he has flown helicopters, including the Bo 105, a diversity of small planes, ultra light aircraft, gliders. He also did Air-to-Air Refuelling of different kinds of aircraft. SCIENTIFIC SPECIALIZATION: Mass Spectroscopy, gas chromatography and applications of chemical analytical devices, while his main interests are fluid dynamics and EDV. Family: Cosmonaut. Country: Germany. Spacecraft: Mir. Flights: Soyuz TM-13, Soyuz TM-13 Austromir, Soyuz TM-14 Mir 92. Agency: DLR. Bibliography: 5388. 1952 August 23 - . Birth of Klaus-Dietrich Flade - . Nation: Germany. Related Persons: Flade. 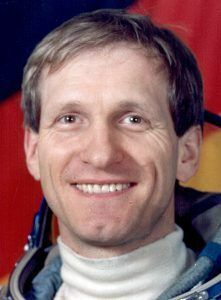 German engineer cosmonaut 1990-1992. 1 spaceflight, 7.9 days in space. Flew to orbit on Soyuz TM-14 (1992)..